Use CB2 to test flat cables with IDC wiremount sockets. The standard version includes dual-row shrouded latch headers for 60, 50, 40, 34, and 26 pins. 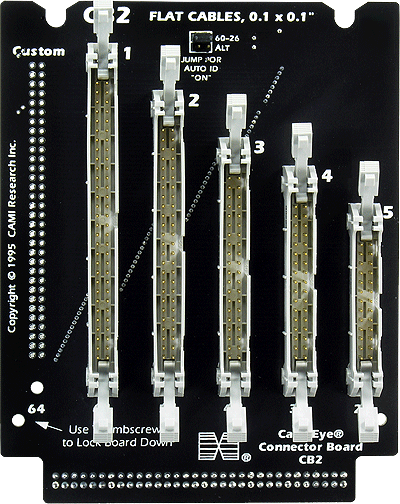 Item 732A provides the same board but with 24-, 20-, 16-,14-, and 10-Pin headers. One 64-position slot is open for a User-supplied custom size up to 64-Pins. Bare headers may be substituted for shrouded latch headers on special order. Set of two boards.